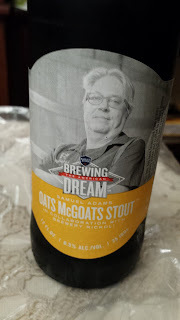 This week's Sunday Night Suds looks at "Samuel Adams" Oats McGroats Stout. 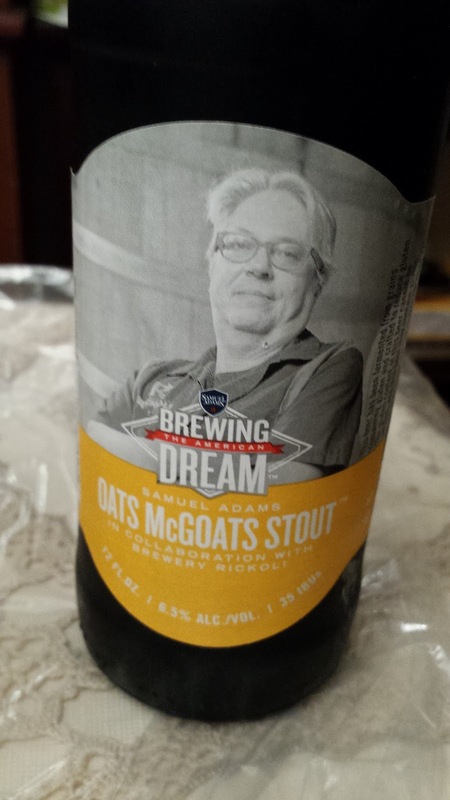 I used the quotes around the Samuel Adams because this beer, along with four other varieties, are part of the Samuel Adams "Brewing the American Dream" line in which they partnered with other breweries as a mentor, in order to help them develop and distribute product. The beers include collaborations with five breweries: Three Ninety Bock (made with Roc Brewing Co.); Desert Kaleidoscope IPA (made with Bosque Brewing); Time Hop Porter (made with ChuckAlek Independent Brewers); Tea Party Saison (made with Woods Beer Co.) and Oats McGoats Stout, which was partnered with Brewery Rickoli. (For a great article on the mentor program, click here http://www.chicagotribune.com/dining/drink/beer/ct-sam-adams-beer-mentor-program-20170717-story.html). The beer poured a dark black, darker than even a Guinness Stout. The first pour released an aroma of dark coffee and the sip was not disappointing. But this beer is more than just a stout as there are chocolate notes and even a bit of spice. The beer was not as thick as I was expecting, but that just allowed me to appreciate it with Mrs KB's sliders as the beer was not a meal in and of itself. The Samuel Adams Oats McGroats Stout is under the Kosher Supervision of the Star-K and has a Star-K certification mark on the bottle. To see what the experts on Beer Advocate think about this brew, please follow this link - beeradvocate.com/beer/profile/35/279348.